This entry was posted in shotgun, weapon and tagged 12ga, ATI, semi-auto. Bookmark the permalink. She appears to be a big girl, Oleg. 5’10” or more I’d guess using the shotgun for scale and assuming that’s an 18″ barrel at least. And you’re right. 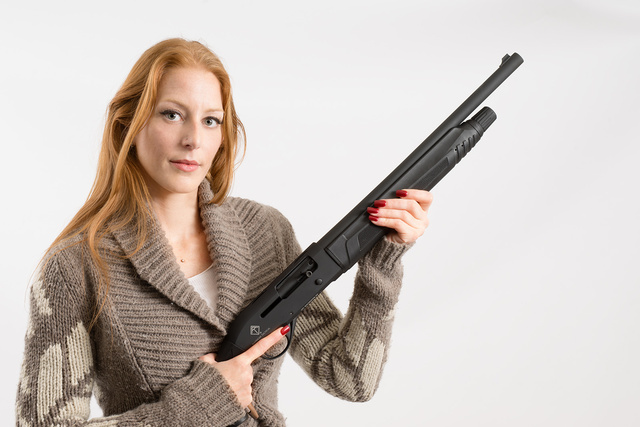 Even without the shotgun, if you rile up a redhead like her she could make you wish she’d have shot you instead. Its the blue eyes. My wife is of Norse/German ancestry . If she gets mad at somebody you can see all those blond guys in her eyes, rowing south. The northmen’s children, get real quiet too. With women hair color is optional . Watch the eyes and then the hands. You don’t want to mess with that gun. Is that the new Beretta 1301? I’ve got a 1201 and love it, although I’d like the ability to increase the capacity, as can be done with the 1301.